The youngest Knowles sister is definitely a fashion risk-taker, considering she wore a caped pantsuit to her wedding, and Solange Knowles dress for the 2015 Met Gala is a great indication of that. 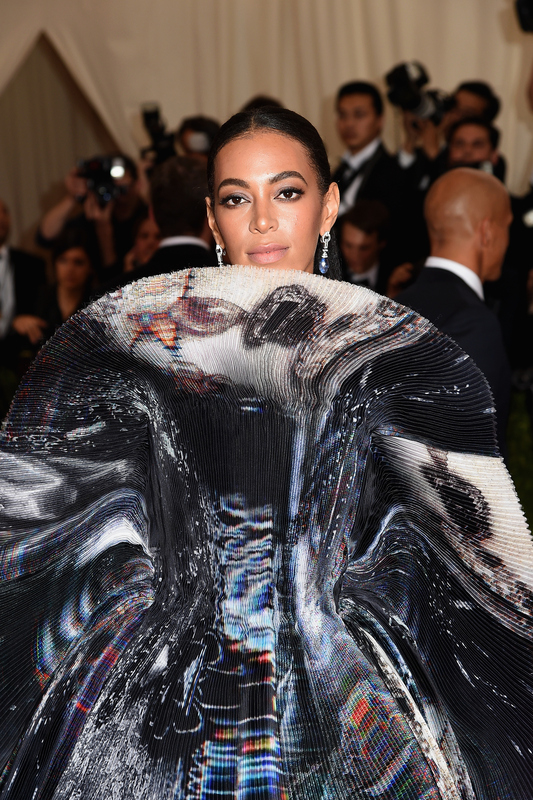 Knowles arrived to the Met Gala wearing a unique, structural Giles dress that is anything but safe. The producer/fashion icon shared a photo on Instagram of her unique ensemble before heading to the event, since Anna Wintour has famously banned social media at the Met Gala. Knowles' dress boasts a rather unconventional shape. It's almost like she is wearing a saucer around her waist, with structured, almost wing-like fabric on the sides. She probably won't be able to put her arms down all night, but she definitely looks like a diva/goddess because of it. Perhaps she wore this large dress so she couldn't fit in an elevator, therefore avoiding any potential squabbles with Jay-Z? Too soon? I'm not a huge fan of this dress, but if you're going to take a risk and look like a seashell, or a stingray, or a frilled-neck dragon (which is a real animal in existence, I swear), there is no better opportunity to do so than at the Met Gala. When you're surrounded by avant garde designers, Vogue's elite and other celebs, you can pretty much wear whatever you want.